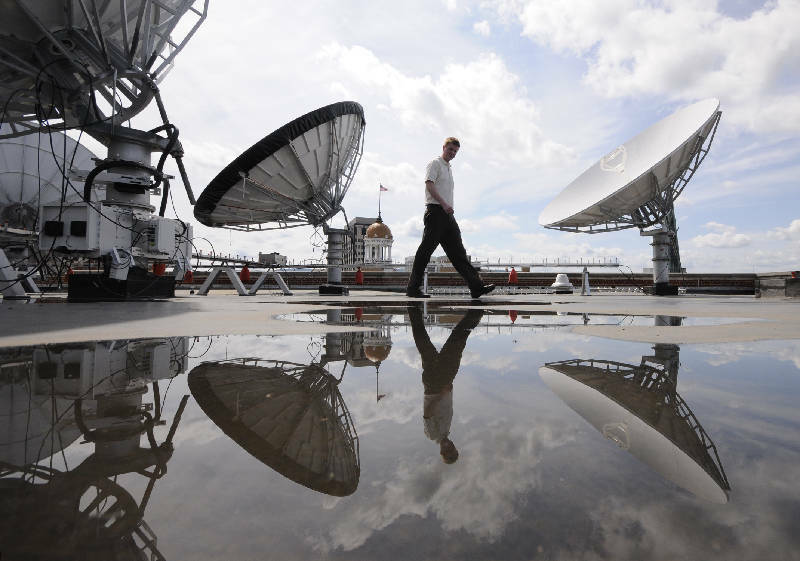 Luken Communications Vice President Matt Winn walks among the Dish Network's 10 satellite dishes atop the TV empire located on East Eighth Street. 2008 - Luken Communications buys RetroTV (RTV) from bankrupt Equity Broadcasting Co. with such shows as Peter Gunn, Starsky & Hutch, Police Story and The Rifleman. History: Started in 1983, TNN was primarily on cable TV channels until 2000. The network later was converted to Spike TV. Programs: Crook and Chase, Memories of Grand Ole Opry, Celebrity Kitchen, the Red Skelton Hour, Music City Tonight, Country Vibe, Larry's Country Diner. Chattanooga businessman Henry Luken made his original fortune using new telecommunication technologies and regulatory freedoms to offer consumers a cheaper way to get long-distance telephone service. In his latest business venture, Luken is going back to the past with a country flair to offer TV viewers a cheaper source of entertainment. The telecom pioneer, who already has invested millions of dollars in the past five years to acquire the broadcast rights for old movies and TV shows for such networks as RTV, Tuff and My Family, will soon launch what he expects will be his biggest TV network yet. By this fall, Luken Communications plans to bring back The Nashville Network (TNN), one of the original country music channels that CBS inadvertently gave up as the channel later morphed into today's Spike TV. "We're trying to add as many flavors to our mix as we can, and this (TNN) is one we determined will have a lot of appeal," Luken said. "I think within 12 months, this could be our largest TV network yet." The Nashville Network has a proven track record, attracting millions of viewers as a cable channel from 1983 to 2000 with its staple of shows from the "Grand Ole Opry" to the "Red Skelton Hour." After an attempt to attract younger viewers with a different country music format failed, TNN evolved by 2003 into Spike TV. Jim Owens, the 74-year-old Nashville producer who helped produce more than 10,000 TV shows over the past half century and still produces the popular "Crook and Chase" show, acquired the rights for the former TNN shows a couple of years ago. Owens found that CBS Viacom had let its broadcast rights on the old programs expire. Under the arrangement between Owens and Luken, The Nashville Network should be back on broadcast stations across the country by Oct. 1. The new channel could be on the air in Chattanooga even earlier on one of Luken's own low-power stations. "Everybody I talk with about this is very excited, and I think there is a huge audience potential for these old shows and the new programs we hope to bring along as well," Owens said. Owens said he approached Chattanooga-based Luken Communications last year to help put the old shows back on the air and revive the network Owens had helped to build. Luken is already airing a handful of other networks of old TV shows across the country on more than 200 of the new digital substations. Luken's networks are targeted at the digital offspring channels created when TV stations converted from analogue to digital signals and picked up the capacity for five or six more channels. Most of the new digital offspring from the major network affiliates are not on cable systems, and many viewers are not yet aware of the expanded local offerings of on-air TV signals. But Luken and other broadcasters tapping into the expanded TV airwaves are convinced the market for the new stations will grow as money-conscious consumers recognize they can still get a variety of programming without paying for cable TV every month. "There is a real mission here because we don't think people who are making twenty to thirty thousand dollars a year should be spending a thousand dollars a year on cable TV to watch television," Luken said. "As much as possible, I want to use the public airwaves to provide as much free entertainment and other content as possible." Luken said he owns the broadcast rights to more than 30,000 TV shows and movies and has limited broadcast rights for another 10,000 such shows. Luken, who made a fortune pioneering a low-cost long-distance phone business in the 1980s, is applying his computer software and telecom genius to build and deliver an array of new television networks using the old shows. Luken acquired the former Retro TV, now simply RTV, from the bankrupt Equity Broadcasting Co. in Little Rock in 2008. In 2009, Luken teamed up with Seals Entertainment Co. to launch the male-oriented digital multicast channel Tuff TV. Last year, Luken became a part owner of My Family TV along with ValCom and joined with Classic Media to start a children's network known as PBJ. In Chattanooga, Luken also has joined with Frost Cutlery to launch the Frost Great Outdoors channel and later this year Luken plans to start My Car TV for automotive enthusiasts. Luken says he is considering adding more networks devoted to Westerns, science fiction and other dramas. "There are still lots of opportunities," he said. "But I think TNN should be one of the best." From an old bank data processing center on Eighth Street, the 70 employees of Luken Communications digitize the old TV and movie tapes and individually send the programming signals out across the country to hundreds of stations via a bank of 10 satellite dishes on the roof of the five-story building. Luken divides the available commercial time -- usually about five minutes every half hour -- equally between the local station and the network. With each network, Luken will have time for 5,000 or more commercials a month. Luken Communications also is expanding its own broadcast properties. Last year, Luken bought 78 former low-power TV stations previously used by the religious broadcasting network Trinity Broadcasting. Luken said he hopes to convert the small analog station to digital signals, allowing each of the stations to broadcast up to a half-dozen more signals and networks at the same time. Matt Winn, a vice president for Luken Communications, said some of the low-power stations Luken has acquired will be moved closer to major population centers to expand their audience. "We're taking the stations, which are primarily in rural areas, and we're hopping them in 30-mile increments into major markets," Winn said. "In some areas, we're going from rural central Florida into Tampa-St. Petersburg market with more than 3 million potential viewers. This will exponentially increase our market." Many of the low-power stations also could move to towers of network affiliate broadcasters who will partner with Luken. "Our ultimate goal is to be on cable in as many markets as possible," Winn said. "But there is still a great and growing audience for over-the-air stations and we think with all of what we are offering we will be well positioned to capture a good share of that market."